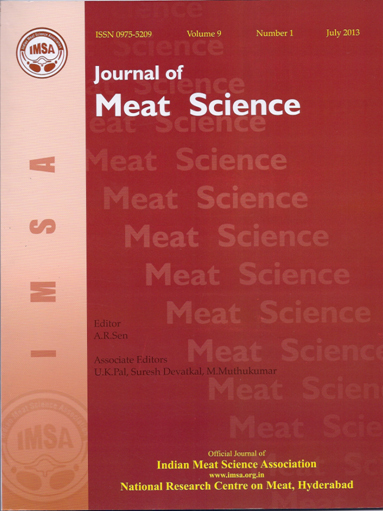 The Journal of Meat Science is a biannual publication of Indian Meat Science Association (IMSA), Hyderabad devoted to original Research contributions in all branches of Meat Science and Technology. The journal publishes the following types of papers. 2. Research papers with a maximum length of 15-16 manuscript pages, including figures, tables and references. 3. Research notes limited to a maximum length of 9-10 manuscript pages, all inclusive. The manuscript for Journal of Meat Science should be prepared in double-space in A4 size, leaving margin on all four sides. The paper must be original and not submitted elsewhere for publication and submitted by E-mail only. I. The Manuscripts of the research paper should be arranged in the following order. a) The title of the paper is to be typed in capital/lower case letters. b) The authors’ names in capital/lower case, followed by their Institutional affiliation. c) Provide telephone number and E-mail id of the corresponding author. include all the main topics discussed in the paper. e) The text should start on a new page with INTRODUCTION, MATERIALS AND METHODS, RESULTS AND DISCUSSION, ACKNOWLEDGEMENT (if any) and REFERENCES. Research notes will not have these headings except REFERENCES, however, other sub headings should be there. II. INTRODUCTION should have a brief review of literature with clear definitions of objectives, purpose and novelty of the work. MATERIALS AND METHODS must indicate methods of sampling, number of replications and relevant statistical analysis. ACKNOWLEDGEMENTS: Indicate funding agency and Project Number if any. Or simple acknowledgement to University or Institute. COMPETING INTERESTS: The authors have no known competing interests either financial or personal between themselves and others that might bias the work. ETHICS STATEMENT: For studies involving animal experiments including slaughtering, transport, or invasive procedures on live animals must include a statement indicating that the protocol and procedures employed were ethically reviewed and approved by the appropriate Institutional animal ethical committee confirming compliance with all requirements. V. REFERENCES should be cited at the appropriate points in the text by giving authors’ names and year in bracket i.e. (Smith 1990; Smith and Gibbons 1990; Smith et al. 1992). A list of references, in alphabetical order, should be given in the Reference section. Pal UK, Mandal PK (2014) Animal products and human health, In: Animal Products Technology, (eds) PK Mandal and AK Biswas, Studium Press (India) Pvt. Ltd, New Delhi pp 1 – 17. VI. Tables and Illustrations: Tables/figures with a brief title identified by Arabic number should be arranged at the appropriate place inside the text. IX. All the articles will be sent to the Referee and author(s) should follow the suggestions of the Referee and the Editor. X. A “No objection Certificate” from the Head of the Department / Institute must be furnished with the article at the time of submission.